Prior to Saturday’s My Bariatric Solutions 300 at Texas Motor Speedway, not many people knew the name Bayley Currey. Some people still may not know who he is. Currey, 21, recently moved to the Charlotte area to pursue a mechanical engineering degree at the University of North Carolina-Charlotte, transferring from Texas State University. While schooling may have been one focus, bettering his driving career held a big draw. Thus, he joined Rick Ware Racing in the summer of 2017 to help at the shop. Less than eight months later, after attending his first race as part of the team at Michigan International Speedway, he piloted an XFINITY Series car for BJ McLeod, who was driving for RWR at the time. Currey had an eventful first couple practice sessions at the reconfigured track, despite turning the 28th quickest time in opening practice. In final practice, the No. 8 car spun off Turn 2, and yet was still fast enough for 32nd on the speed chart, ahead of McLeod. The rookie driver admits that McLeod helped him throughout the weekend, and appreciates what he was taught prior to the race. However, had he hit the wall, the team didn’t have a backup car, and thus he wouldn’t have made his series debut. 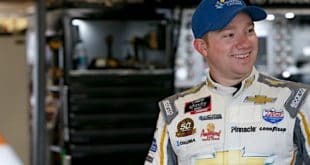 Though he was being told by a more experienced driver what to do, and where to lift, it was still Currey’s first career XFINITY race. 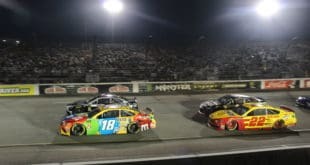 Overall, it was just his fifth race in one of NASCAR’s national touring divisions, thus making it challenging. “I had never raced on that track before, except on the quarter-mile on the front straightaway,” he said of Texas. “Obviously, I didn’t want to go in the grey area, and I had a little bit of trouble there. I would say it took me until 25 laps into the race where I felt comfortable moving my way through Turns 1 and 2. “I kind of knew what I was doing and whatnot, but to know exactly where I wanted to be and how to maneuver the car, it took me a little while. [Turns] 3 and 4 was pretty easy because there is so much banking, but 1 and 2 is so flat, that it took me a little bit to figure it out. Currey admitted that because the team was unable to get through the Optical Scanning System in pre-qualifying, the only way the team could go was forward. Currey ended the opening stage in 30th, moving up to 27th by the end of Stage 2. In the final rundown, the No. 8 car crossed the finish line in 22nd, equaling the second-best finish for B.J. McLeod Motorsports this season. This season, Currey’s competed in one additional NASCAR event, driving in the Camping World Truck Series at Las Vegas Motor Speedway. 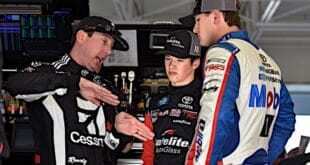 That night, he finished 20th for Copp Motorsports. Moving forward, he’s unsure of when he will be back inside a racecar. 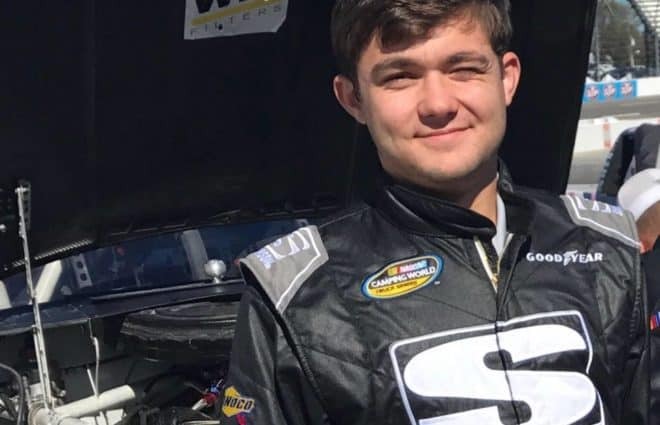 He admitted that he and his father are working on finding sponsorship to make his Monster Energy NASCAR Cup Series debut with Rick Ware Racing next weekend at Richmond Raceway. At the time of publication, nothing has been finalized. It’s all about money, and it will determine whether or not Currey can advance his racing career. Forty-one cars are on the preliminary entry list for this weekends Fitzgerald Glider Kits 300 at Bristol Motor Speedway. There are no Cup Series drivers eligible to compete, as it’s one of the four Dash 4 Cash races. 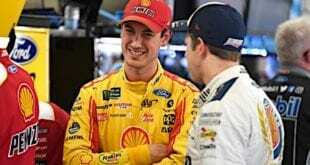 Christopher Bell, Daniel Hemric, Cole Custer and Ryan Preece are the drivers in contention for the $100 thousand bonus. This will be Preece’s only shot at the money, as he doesn’t have a ride for Richmond, Talladega Superspeedway or Dover International Speedway. Shane Lee and Tony Mrakovich will be making their series debuts at Bristol. Lee will be behind the wheel of the famed No. 3 machine, while Mrakovich fills in for Dylan Lupton in the No. 28 at JGL Racing.